Air Canada Jazz flight AC8953 heading from Fredericton, N.B., to Toronto was forced to make an emergency landing at the Ottawa airport this morning after reports of smoke in the cockpit. Air Canada Jazz flight AC8953 was headed from Fredericton, N.B., to Toronto this morning when it was forced to make an emergency landing in Ottawa after reports of smoke in the cockpit. The Ottawa Airport Authority confirmed the flight landed safely around 6:30 a.m. ET. Air Canada spokeswoman Debra Williams said flight AC8953 had reports of smoke in the cabin and was forced to land in Ottawa. "Passengers were moved by ground transportation into the terminal and were booked on alternate flights to their destination. We apologize to our passengers for this incident and inconvenience," Williams said in a statement. Janice Shaw, who said her family was on board and safe, also said on Twitter that a flight headed from Fredericton to Toronto made an emergency landing in Ottawa. Sean Costello tweeted this photo that shows emergency crews on the tarmac at Ottawa's Macdonald-Cartier International Airport on Wednesday morning, after a Toronto-bound flight made an emergency landing. 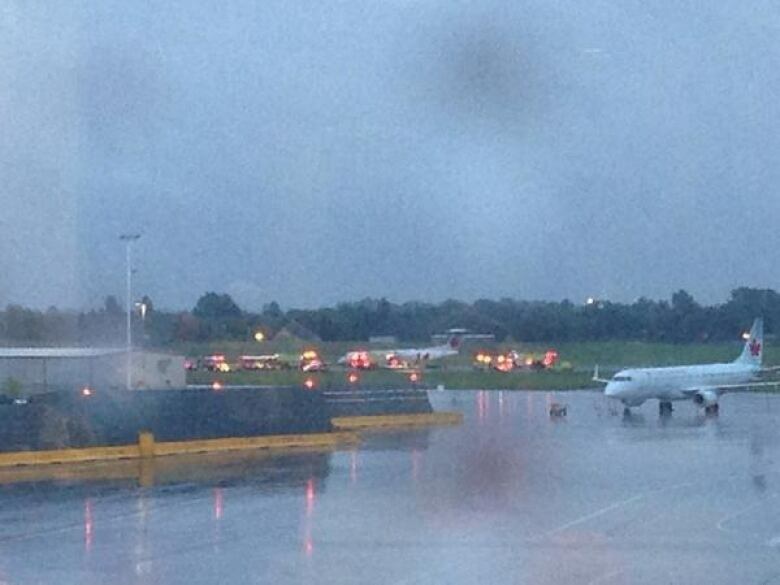 (Photo supplied by Sean Costello)Ottawa firefighters and paramedics were also called to the airport. Paramedics did not treat anyone for injuries, while firefighters were told to stand down before arriving. Paramedics were called around 6 a.m. There were four crew members and 69 passengers on board. A couple of people waiting to fly at the Macdonald-Cartier International Airport tweeted their flights were delayed due to the landing. Air Canada said the plane is currently being inspected and the cause of the smoke has not been determined. The Transportation Safety Board of Canada said they've dispatched a team of investigators to the airport to look into the incident.